Want to know why trans women are so poor? This is why. Estradiol Valerate is a medication that I’ve been using for the past 6 months ago. I’ve been on hormones for over 2 ½ years now, and it was only a half year ago that I finally found the magic combo of meds with my doctor, Dr. Powers, that got my levels where we wanted to be. So now, coming into this new year, there’s been a persistent shortage of the one medication that I need to keep my body full of hormones. Any hormones. My body cannot produce testosterone anymore, so without estrogen to take its place, the body becomes lethargic and slow. There has been no news on this shortage, though I have spent the past 2 months trying to find my prescription. I called pharmacies as far east as Maine, and as far west as Portland and San Diego. Throughout this time, I’ve been trying to keep my estrogen levels up as much as I can using tablets that I’ve stashed away over the years, administering them as a suppository, because any estradiol that goes through my liver, gets converted to estrone, which greatly diminishes its effects. Even with this, my estradiol levels were about ⅓ what they used to be, and testosterone is practically non existent. Its been a rough couple months. Finally, however, I managed to snag a vial and have it shipped to a local walgreens. 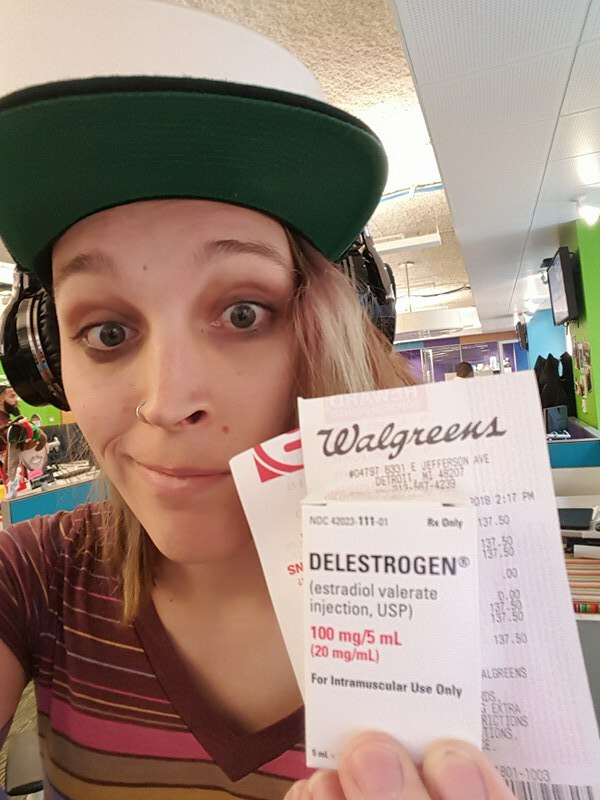 Today I gave myself my first estrogen shot in 2 months. Maybe its a placebo, but I already feel better. What bugs me though is that Estradiol Valerate has been unavailable for months now, and the only thing I could find after this time is the name brand medication. I have good insurance. I have a steady job and I’m able to support myself. This is an incredible privilege that the majority of trans women out there do not have. So, when 1 month of one of my medications costs $137 even after my insurance’s contribution, I wonder how other trans people out there are faring. This medication isn’t “elective” or “cosmetic”. For alot of us, we simply cannot live without this medication, and still, a shortage like this isn’t important enough to report anywhere, and when it is available, some of the best health insurance out there is only able to cover enough to bring the price down to $137. This is why trans people are struggle so much. One of the reasons, anyways.